On behalf of management and staff, we would like to welcome you to Emirates Equestrian Centre (EEC). Please have a browse around our website to see what we have on offer and to view our world-class facilities. Offering only the highest standard in husbandry and yard management, EEC takes great pride in the care we offer, ensuring our Centre is at the top of its game. Here you will find excellent equipment for training in dressage and jumping, a quality maintained cross-country course with 21 safe but challenging fences, an International sized show jumping arena with premium Martin Collins Poly Track footing, and 5 additional arenas to fulfill all your training needs. Hacking is literally on our doorstep and with a lake and tracks close by, the desert is yours to discover. As the only fully approved British Horse Society Centre in the Middle East, you can be guaranteed to find the highest standard of training offered by our qualified Instructors. We cater to all levels of riders, from beginner to advanced, and provide well trained horses outfitted with quality tack for you to enjoy. Our riding school season runs from mid-September to mid-June. The competition season runs from mid-October to mid-April. During these months, EEC is an active events Centre. Offering training shows for grass roots competitors all the way up to FEI World Cup qualifiers. 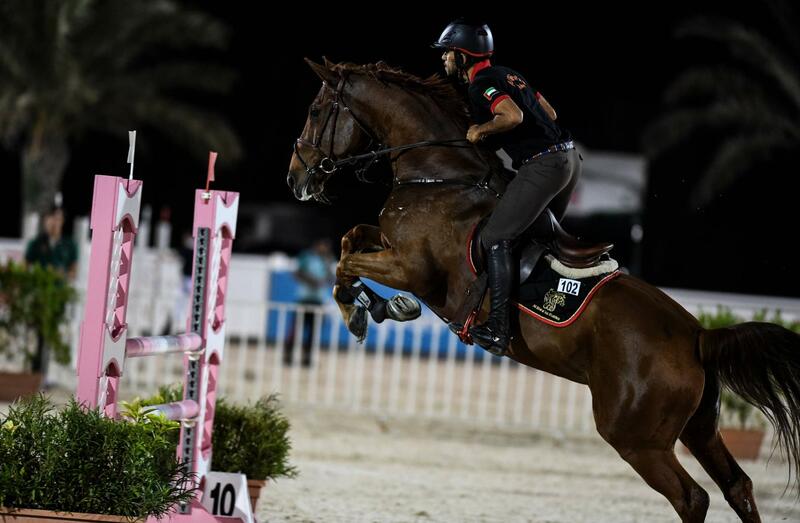 We host National Show Jumping and National Dressage competitions, the FEI World Dressage Challenge and the Dubai Show Jumping Championship (CSI-W Dubai). In addition to these spectator friendly events, we offer Pony Club rallies, camps, and clinics to all our riding school clients and livery owners. We are fortunate to be situated near the prosperous city of Dubai. Just next door to us you will find the stunning Bab Al Shams Desert Resort and Spa, Dubai International Endurance City, a nature reserve and 80km desert Cycle track. Our wonderful team at the Centre’s Al Faris coffee shop is waiting to welcome you for breakfast, snacks and dinner. For over 20 plus years EEC has been an active British Horse Society (BHS) riding and training Centre. As a universally recognized training standard, the BHS aims to improve the level of equestrian knowledge increasing enjoyment for riders and for the good of all horses. The BHS sets the mark for professional qualifications respected the world over. Throughout the season, EEC offers training to clients wising to achieve their BHS qualifications beginning with the Progressive Riding Tests and continuing through to the BHSAI, which is the first level of the professional teaching qualifications. Additionally, we offer further training to those wanting to achieve a higher goal. The Dubai Branch of the Pony Club was established over 20 years ago, when the Emirates Equestrian Centre was first opened. The Dubai Branch works alongside the Pony Club which was set up as a part of the British Horse Society. The Pony Club at EEC currently has 40 members both boys and girls. All EEC riders are eligible and welcome to join and members are grouped according to age and ability. We have an excellent team of instructors and helpers making Dubai Pony Club one of the best Pony Clubs in the world. The livery package offered at the Centre includes bedding, forage and feed, 24 hour security, one groom shared between 4 to 5 horses, full use of the Centre’s facilities and discounted lessons on your own horse/pony. Our riding school season runs from mid-September to mid-June. The competition season runs from mid-October to mid-April. During these months, EEC is an active events Centre.